Amaju Pinnick wins NFF election – Royal Times of Nigeria. 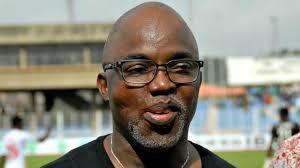 Amaju Pinnick, reelected the Chairman of Nigeria Football Federation. Pinnick polled thirty four votes to beat three other contestants to retain his seat. Alhaji Aminu Magari got eight votes; Chief Taiwo Ogunjobi got two votes while Honourable Chinedu Okoye did not have any vote. In all, fourty­­-four delegates from states football federation and other bodies including coaches, referees associations and players unions, participated in the election which took place in Katsina State. FIFA representatives, Luca Piazza and Solomon Mudege aiso witnessed the election with other football chiefs who witnessed the election.